*for single phase kVA is based on an assumed load factor of 0.8. 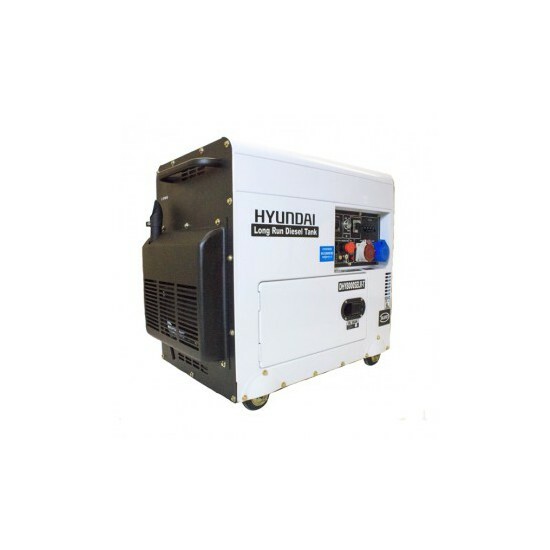 The DHY8000SELR-T is a compact yet powerful long run standby generator from Hyundai offers either switchable 230v single phase or 400v 3-phase voltages. The DHY8000SELR-T is ideal for workshops, garages and home use. The large 30L fuel tank increases running time to a maximum of 30 hours, powered by a 4-stroke, air-cooled 456cc single cylinder Hyundai diesel engine, the DHY8000SELR-T has a maximum output of 6kW/7.5kVA. The control panel features 1 x 32A 230v single phase socket and 1 x 16A 400v three phase socket plus a 12v DC battery charging outlet. The ATS (Automatic Transfer Switch) can be connected to an ATS system for maximum convenience. When the ATS module detects a loss of power from the mains supply it starts your generator up automatically and switches the supply from mains to generator. When the mains power resumes, it switches back to mains supply and switches the generator off. 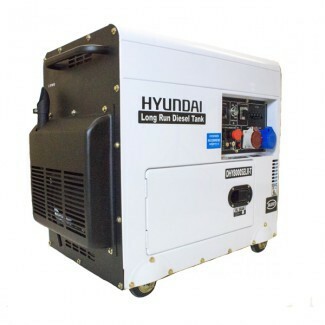 This electric start diesel generator, can be started with a two wire start function or a simple turn of the key being all that’s required to start or stop the machine when controlled manually. Housed in silenced casing, the DHY8000SELR-T is an extremely quiet machine and will keep disturbance to a minimum for you, your family or your employees when powering your building. With a sound rating of 70dB @ 7 metres. The DHY8000SELR-T is economical to run, using roughly 1L of diesel every hour. Since the DHY8000SELR-T can run on red diesel, which is significantly cheaper than the white diesel you put into your car, running costs can be kept to a minimum. For information on how to properly maintain this diesel generator, please view our diesel generator maintenance checklist here. In the box: Main Unit, 3 Spanners, Screwdriver, 12v DC Charging Cable, 2 Manual Start Keys, Fuel Filter, 1 x 16A 3-phase plug and 1 x 32A 230v plug. Covered by a Hyundai 1 year standard warranty.